Track mailbox sizes effortlessly using this report. 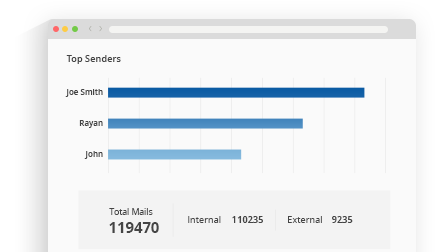 In addition to mailbox size, this report also displays the number of items in each mailbox, the status of storage limits, and a clear-cut graphical representation of the top 10 mailboxes by size. Analyze the email traffic statistics in your Exchange organization using these comprehensive reports. With this information by your side, you can easily keep track of the mailing activities of your mailbox users. Of particular importance is the Email Response Time report, in order to adhere to an email response SLA. View the storage capacity of your Exchange servers easily. 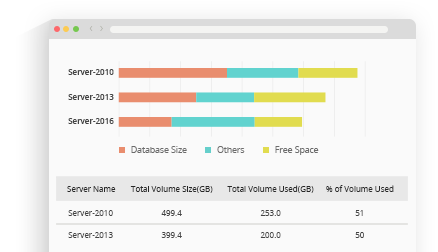 This reporting tool quickly gives you information about the amount of storage space used by stores and the space available in both tabular and graphical formats. 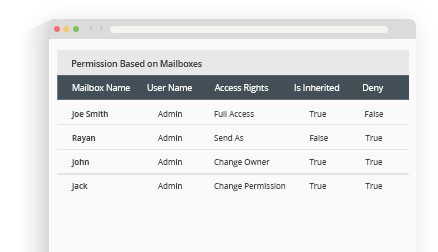 Manage mailbox permissions efficiently for your Exchange organization spanning across server versions 2003, 2007, 2010, 2013, and 2016. 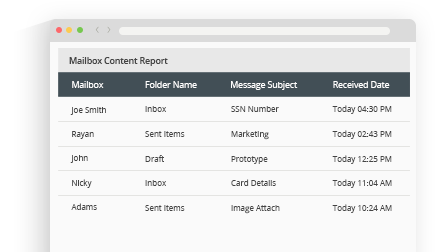 Additionally, you can ensure safety of all your mailboxes' information by tracking permissions using these reports. View complete information about ActiveSync enabled devices including the status of the applied device policy, inactive devices, and a summary of sync requests. 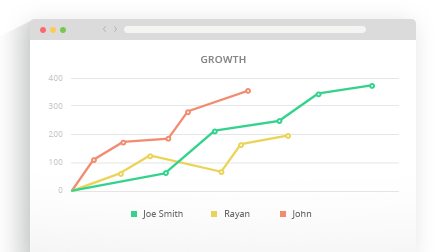 With this data by your side, managing mobile devices in your organization becomes so much easier! Track all users in your organization who access your Exchange servers via Outlook Web Access using these reports. Get detailed information about OWA logons, right up to the client IP they originated from. Locate specific messages in your organization based on particular keywords in their content using these mail search reports. Easily discover malicious messages based on keywords with a single mouse click! Meetings can now be hassle-free! Use this report to view the status of rooms in your organization and avoid delays in meetings by checking on the availability of conference rooms.